100% COMPATIBLE ON ALL MOTHERBOARDS. WORKS ON MAC AND PC. SUPPORTS DUAL CHANNEL . 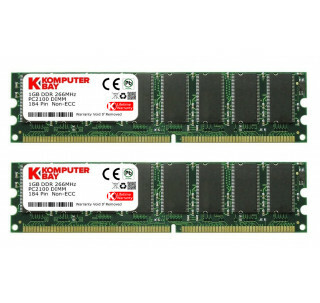 BRAND NEW 2GB (2x1GB) PC2100 DDR 266 Mhz. 64x8 LOW DENSITY. Both cards were defective and had to be returned unusable. Worked Perfectly on a Dell Computer! Review by T. C. Bader "tbader"
Bought and installed 2gb for my Dell Optiplex gx260. It replaced the 768k which came with the system. Both boot time and applications are faster! Amazon partner has solid customer service! Review by Steve "Steve"
What I was really looking for was a 2GB memory stick. I still don't know if they are available? Memory Purchase - XLNT transaction Review by Ernest Marsalis "trader52"
Good Product - Great Price Review by Chris "ndyardsheep"
No complaints! Review by S. Chattopadhyay "suddho"
I was unaware of the certain types of memory and how some of them can not run on certain motherboards when I ordered the RAM from KOMPUTERBAY. I called their customer service and talked to someone in Tech Support. I told him the RAM did not match the same ones I had in my computer. He explained to me why the memory did not work. 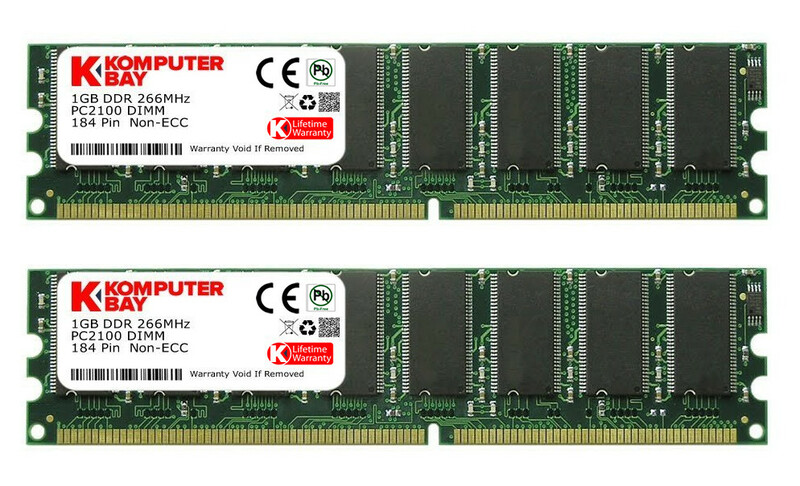 The Tech said they would replace it with the right RAM for my computer, in which they did. The replacement was delivered in a very timely manner. Happy with product, our HP 864n media center was on it's last leg, so along with a new motherboard, power supply, and new memory from your company our computer lives again. It took a little research to decide if this product would work in my computer. Does what it's supposed to do Review by Creedeco "Tom"
Great purchase. Fast shipping Review by R. Granger "grangeramp.com"